Cardiff TUSC wrote the following letter to Caro Wild, Labour's candidate for the Riverside By-Election in Cardiff. The election will be held immediately after the Labour leadership election. We are writing to you as a council candidate to ask how we can build on Jeremy Corbyn’s call for councils to stand together and refuse to implement government cuts. 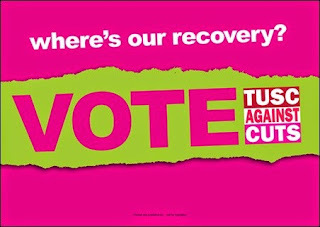 The Trade Unionist and Socialist Coalition (TUSC), co-founded by the late Bob Crow, is determined that working class people should not pay for a crisis that we did not cause, and we are happy to work together with Labour representatives who take the same stance. We believe that Jeremy Corbyn is right to highlight the potential that councils have to resist austerity. Councils still control budgets totalling billions of pounds and have more financial powers than is commonly realised. TUSC has a core policy platform for local councils which can be found on our website at http://www.tusc.org.uk/policy. In the last couple of years TUSC has worked with councillors in Southampton, Hull and Leicester to present legally compliant no cuts budgets to the annual budget-making meeting. Based on the use of reserves and councils’ borrowing powers, they were designed in each case to buy time for the council to organise a broad public campaign to compel the government to restore its funding. Unfortunately, on each occasion, the alternative budgets were rejected by the majority Labour groups. One reason for doing so was that each council Labour group felt itself to be facing the government’s cuts on its own. But surely that wouldn’t be the case now, if Jeremy Corbyn is elected Labour leader? 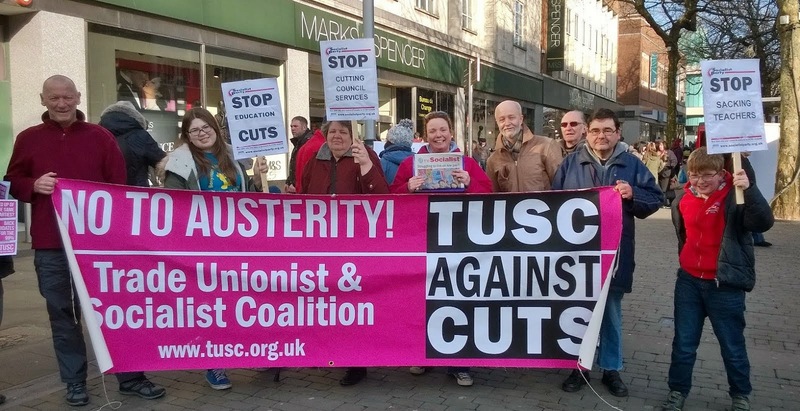 TUSC believes that in the new situation opened up by a likely Jeremy Corbyn victory, there really is no reason why Labour councils and the Welsh government should not combine together and refuse to implement the Tories’ brutal austerity agenda. That is why we would like to seek your view about the possibilities of joint action against austerity, based on our council joining with others to present no-cuts budgets at the budget-making meetings in early 2016. We are writing to you to ask for your pledge to vote against any cuts to jobs and services if elected. The ward you will represent is one that feels the housing crisis most severely, which is why we’re also writing for your assurance that you will call for the Council to adopt a no-evictions policy for those tipped over the edge by the bedroom tax, and your pledge to call on the Welsh Assembly to take the Scottish Road and scrap the bedroom tax in Wales, abolish upfront fees for tenants and introduce rent control to lower rents. There is a desperate and international searching for an end to the failed policies of austerity. Austerity has been brutal, and, as many made clear in the People's Assembly meeting last Thursday, we've had enough of it. But how can we defeat it? How can we put an alternative onto the agenda? There is agony in society, but there is even more coming our way, whoever wins the next election. And not only has Labour refused to reverse the funding cuts, the party plans to make more: all but five Labour MPs voted with the Tories and Liberals last month for another £30 billion cuts to welfare and public services. (UKIP wants £35 billion.) Although Labour has been forced by protests to pledge to scrap the bedroom tax - one of the most hated of the ConDem's attacks on the vulnerable - benefits spokesperson Rachel Reeves has promised to be "tougher than the Tories" on benefit claimants. The SNP, Plaid Cymru and the Greens have pledged to help Miliband carry out this programme if Labour doesn't have a majority of its own. Those parties are also currently implementing austerity at council level. There are many good activists currently attracted to them but, because they're not rooted in working-class communities and organisations, and because they accept the status quo of big business dominating our economy, when tested they do what capitalism wants them to do, even though refusing to carry out cuts is essential if the Welsh language is to get the support it needs and if we're going to tackle climate change. We should fight the attacks with every fibre and with our last breath, in every way possible. That's why I believe the anti-austerity movement is making a big mistake if we don't gather our forces, organise them, unite and stand our own candidates in elections. As things stand we come together to decry the brutality of austerity on protests and rallies, but when it comes to elections we are spread thinly across several parties. We can make a big impact on marches and demonstrations, but our energy and influence is dissipated at election time because our forces are divided and diverted, and in a direction that props up austerity and the parties that support it. Ironically, many of us are anti-cuts campaigners planning to vote for pro-cuts parties next month. That's why they get away with it: because we haven't resolved that contradiction by founding our own party. Some people will be worried about letting the Tories in. But it is precisely the absence of a party that would fight for all ordinary working-class people that is strengthening the Tories. After five years of brutal cuts, any real opposition party should be leagues ahead in the polls. But the Tories' divide-and-rule tactics, turning low-paid workers against benefit claimants, the old against the young, native against immigrant, are still working because there is no party credibly promising to improve living standards for all ordinary people. In any case, without such a party we will get Tory policies whoever forms the government. Of course it's not true that we should wait for the creation of an anticuts party before fighting the cuts. It's not true either that we can't win any concessions until we do: nationally the Coalition has been a coalition of u-turns. And locally, in the five years that I've been Secretary of Cardiff Against The Cuts I've fought alongside campaigners who have stopped the closure of primary schools, playcentres, libraries, youth clubs, swimming pools and many other facilities. This year Cardiff Council was forced to back off from more cuts than ever before, and more than anywhere else in Wales. 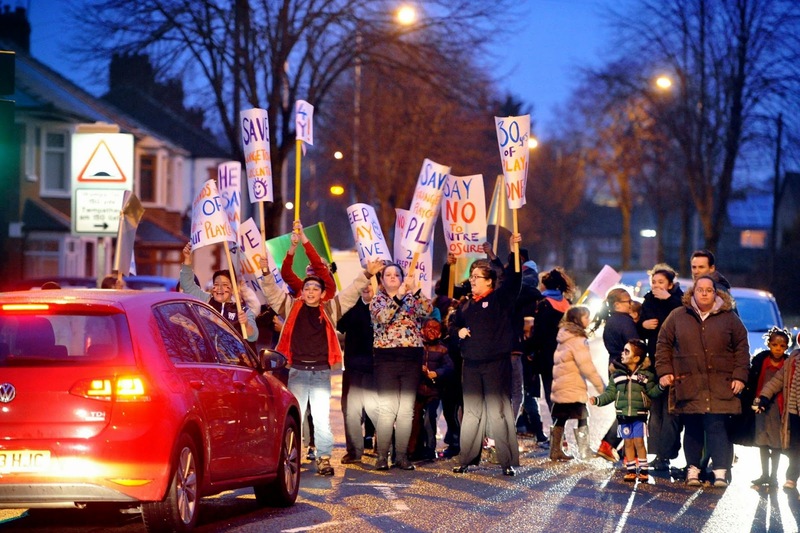 Building the protests was key to this, but so was the threat many campaigners made to stand as anticuts candidates, independently of the main parties but linked up with one another. What happened this year in Cardiff is proof that, if you're aim is to pull Labour to the left, the best way of doing that is to drag them to the left from the outside. But what this year also shows is that protesting isn't enough - Cardiff Labour Council still got away with making another £41 million of cuts to services. To stop the cuts we must continue to march, protest and strike together, but we need to take a stand in elections together too. There are 135 candidates in the General Election this year who have committed to that project, including in a third of the seats in Wales. They're linking up through the Trade Unionist and Socialist Coalition, known as the "Coalition Against The Cuts." They're all community campaigners or trade unionists who have experience standing up for their community and workmates, and ALL of them would make better representatives than the politicians we confront in our campaigning work. But so would many of the people reading this article. TUSC is standing to broadcast the idea of building a new party out of the anti-austerity movement. If you want to find out more about that project, or get involved, or help us fight this election, get in touch with me at Wales.TUSC@gmail.com. Or come to the meeting at 730pm on Tuesday 5th May in the Holiday Inn on Westgate Street. It's time to stop buying the bullets for the firing squad aiming at us, lending our votes to parties that are demanding we pay for the recession instead of the billionaires who caused it. A response to an email from a constituent about opposing FE cuts.. Thank you for your email. I am happy to sign the petition but I notice it only refers to English FE cuts. Unfortunately the Welsh Government, with its willingness to pass on Con-Dem cuts is also making deep cuts to Further Education, particularly adult education. 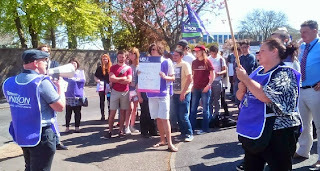 I am a Unison steward in a college in Wales. On Wednesday (April 22) I am urging my members to join the lunchtime gate protests that are taking place in colleges across Wales against Welsh Government cuts to Further Education. The following Wednesday (29 April) trade unionists from colleges around Wales will be lobbying the Assembly to Hal these cuts. Hopefully students will also join us. These Welsh Government cuts are not only a threat to the jobs and conditions of my union members and workmates but also to the opportunities that exist for learning and training in Wales. 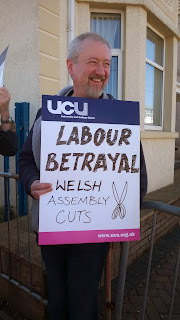 If you look at the Swansea TUSC blog: http://tuscswansea.blogspot.com/ you will find a number of posts about FE cuts in Wales. If you agree with what is written then please share and help us to oppose cuts. It was no accident that today's media launch for the Trades Unionist and Socialist Coalition in Wales took place outside a college. The cuts in Further Education now taking place across Wales are a perfect example of how Welsh Labour is prepared to pass on Con-Dem cuts. The cuts now taking place in Welsh colleges threaten hundreds of jobs and will represent a reduction in learning opportunities for people across Wales, particularly for adults and part-time learners. It would mean the end of the principle of 'lifelong learning' - of learning and training opportunities from cradle to grave. Courses will be harder to find and even where available the cost may be prohibitive for many. The cuts are directly as a result of reducing central funding and other streams of income from the Welsh Government. 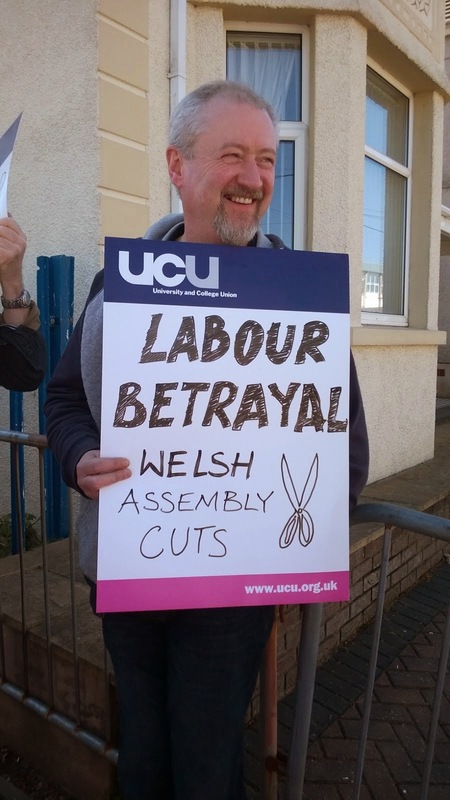 They are exacerbated by the willingness of the Welsh Government to award training contracts, previously delivered by professional staff from FE colleges, to private and third sector providers, some of whom don't even recognise unions. But FE workers are not taking this lying down. An initiative from the lecturers' union, UCU to begin a campaign to put pressure on the Welsh Government to reconsider, is being backed now, I'm glad to say by my union, UNISON, and other campus unions. 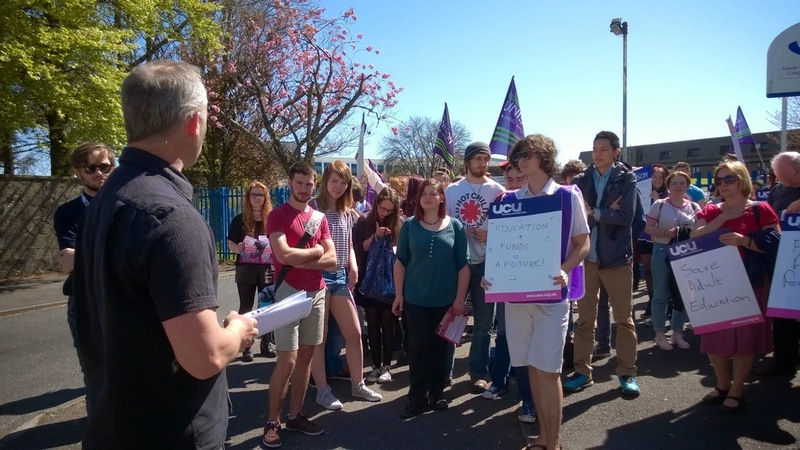 Next Wednesday, 22 April, there will be college gate, lunchtime, protests by FE workers to be followed by a lobby of the Welsh Assembly the following Wednesday, 29 April. These could be really well attended and will be backed by the majority of students. A lot of FE workers will recognise that only co-ordinated national action by campus unions is likely to be needed to force the Welsh Government to rethink. These protests will be important in alerting students and communities to the dangers for education and in building the confidence in FE workers for the fight ahead. Trades Unionist and Socialist candidates in 4 parliamentary seats and 2 council by-elections joined the Global Day of Action on Fast Food Rights in Swansea yesterday. TUSC supports one hundred percent this campaign, launched by the BFAWU, to unionise fast food workers to organise to end zero hours contracts, to fight for £10/hour minimum wage and for union rights.